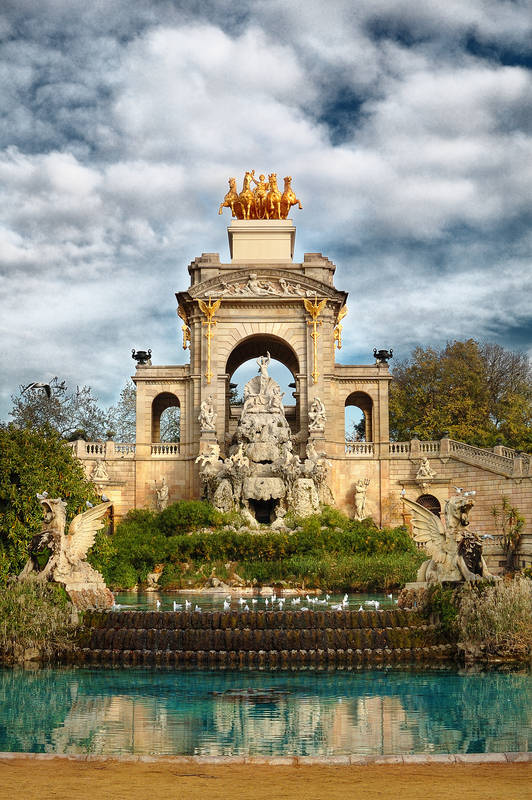 It is an authentic luxury to walk in Parc de la Ciutadella, contemplating the old pavilions, the museums, the statues, the zoo, the lake or the greenhouse. It is a privilege not only for art enthusiasts but to any citizen who enters this magical place, to have such treasures within their reach. We tend to ignore the obvious though. I think we learn to better appreciate our artistic patrimony when we visit one of those monotonous industrialized cities built on glass and steel where art is just a ridicule pastiche in the nearest mall and we remember what we left at home. Of course Barcelona does not have exclusive rights to consider itself as the mecca of art but we do have a thing or two to congratulate upon. Besides the obvious landmarks in the city, and if I had to vote, this fountain, the Cascade by Josep Fontser, would be in my top ten. On previous posts we saw a detail of Aurora's Chariot and of one of the fountain Griffins. Wow, that really is a beautiful fountain, and a quality photo. Great sky. Love the reflections. I'm awestruck. This has to be one of the most beautiful fountains in the world! Positively gorgeous setting and photo. Now this perfect fountain is on my list of hope-to-sees in my future. Once again, Carlos, I think your writing is a jewel in this post. I love this spot in Barcelona, and the picture. There are no tourists in the photo, how did you do it! What can I say? This is my last view of Barcelona… Last time I went there, before driving me to the airport, my friend Albert asked me if there was something I wanted to see in Barcelona before leaving. And I answered him: I want to see that fountain! I sadly did not have any camera then… but I hope to return to Barcelona some day and take all the pictures I want. It's absolutely magnificent, like a huge Iladro statue! The colors are amazing. Especially the blue/aqua of the water contrasted with the blue of the sky.